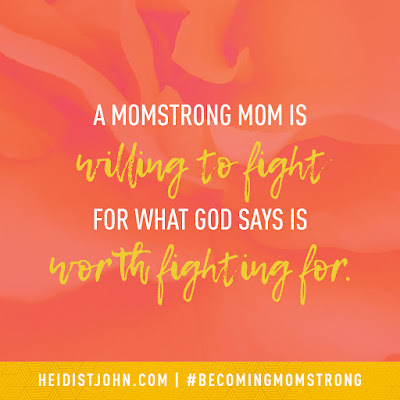 Following on the heels of Becoming MomStrong, Heidi St. John has published a new book entitled Prayers for the Battlefield: Staying MomStrong in the Fight For Your Family and Faith. This little hardcover book is the perfect size to toss in your purse and read in those never-ending moments of waiting to pick your kids up at activities, on a lunch break, or any spare moment you have. 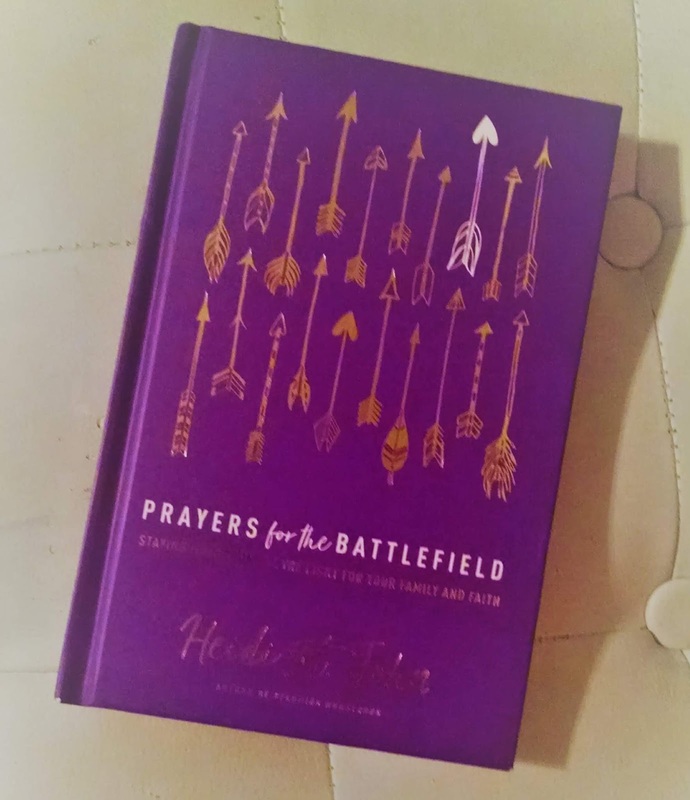 Prayers for the Battlefield is a mixture of a devotional book and a prayer guide. Each chapter is topical (i.e. 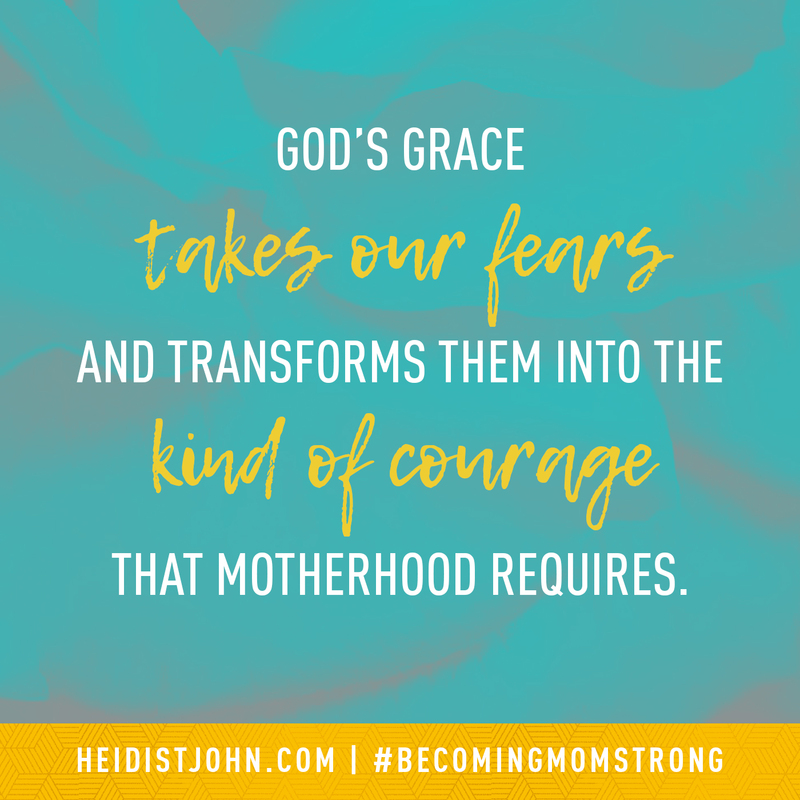 A Prayer for the Mom Who Wants to Live Intentionally, A Prayer for the Worried Mom). The chapter begins with a Scripture passage, and then moves into a short, relatable lesson on the topic. A written prayer closes each chapter, as well as additional Scriptures you can read and add to your prayer arsenal. I recommend beginning by reading Prayers for the Battlefield from start to finish, for lessons on prayer and motherhood. Once you've finished the book, you can return to topics as needed, by referring to the Table of Contents. You may not need to read the chapter each time you return to a topic, but you can use the accompanying Scriptures to pray Scripture for your family and yourself. This is how I plan to use this book now that I've finished reading it. Heidi St. John speaks right to my heart. I have found myself re-reading chapters before moving forward, as well as high-lighting parts that were particularly poignant. 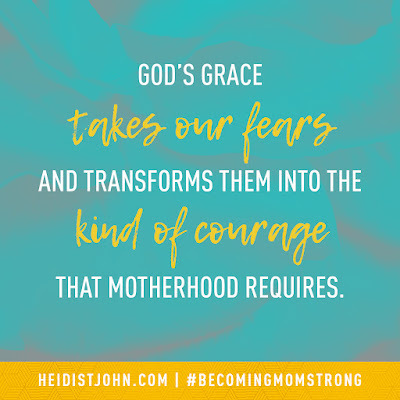 Although Heidi St. John is a homeschool mom and her ministry began in the homeschool community, her MomStrong ministry is geared to all mothers. This book is no different. 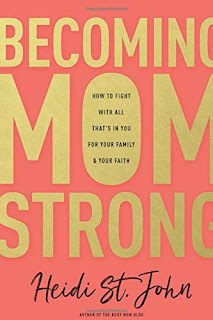 Prayers for the Battlefield will minister to moms of all ages and walks of life who feel a burden to pray for their families. 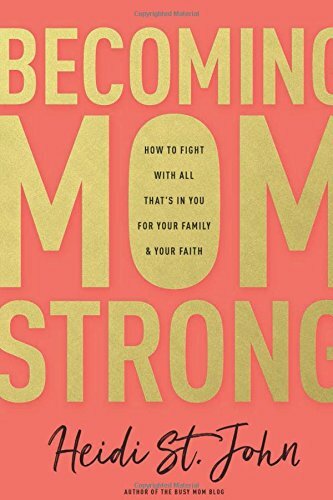 Pick it up now for Mother's Day gifts, or just to encourage the mothers in your life. 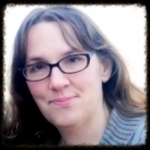 Last year I reviewed Zondervan's devotional for young women, Adored. I loved it, and my twelve year old daughter has loved reading it this year, as well. So when I was offered the chance to review Beloved, I gladly said yes. These books are so well-written and generally well-made. Both books are hardcover books, about 5.25 x 7.5 inches in size. They're over an inch thick with colorful covers and page designs. Beloved includes a ribbon marker to mark your place in the book, which my daughter noticed right away and appreciates. The devotions are short, each only a page long, but meaningful. They're not just fluff. They're not condescending, and they don't try to sound like teenagers talking. There is space to includes notes or a brief prayer of your own at the bottom of each page, though it's probably better to journal in a larger space than to try to respond in the inch or so of space provided in the book. One thing I noticed as I was reading portions of Beloved, is that it starts in Genesis and moves forward! Other than a few readings from Psalms, Proverbs, and Hebrews, the book goes through the Bible in order. The majority of the devotions are actually from Old Testament passages, which is a nice change, since many books want to focus almost entirely on the New Testament. We've been so impressed with these devotions, that we've bought copies to give to other young ladies we know and care about. These books can definitely help a young woman grow in her understanding of God's Word and her place in His Kingdom. 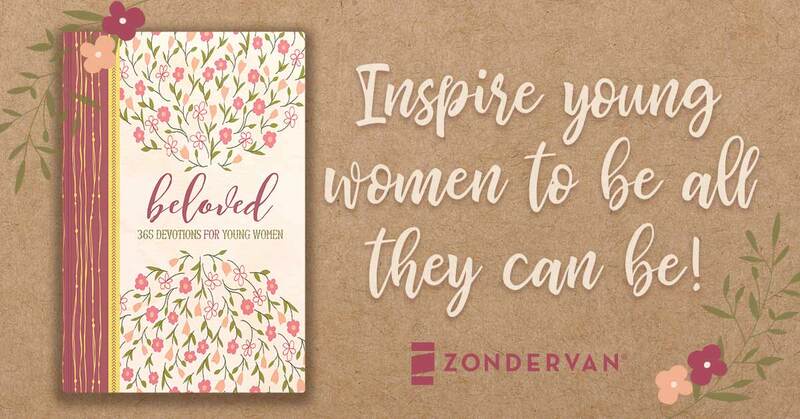 I hope that Zondervan continues to produce these yearly devotional books for young women. I highly recommend them. I started reading this book months ago. I've tossed it into tote bags and carried it to ball games, on car trips, and read it at home before bed. Unfortunately, my reading time was usually interrupted and it has been a slow process. By the time I finished the book, it had somehow picked up a pen mark on the cover. Oops! The majority of this book is written by Clay Clarkson. Each chapter is written from his viewpoint, with a wrap-up at the end by Sally Clarkson. To be honest, I missed reading Sally's warm tone through the chapters. That may be part of why the book took me longer to read. Or maybe it's just that life has grown increasingly busy as a mom and grandma. 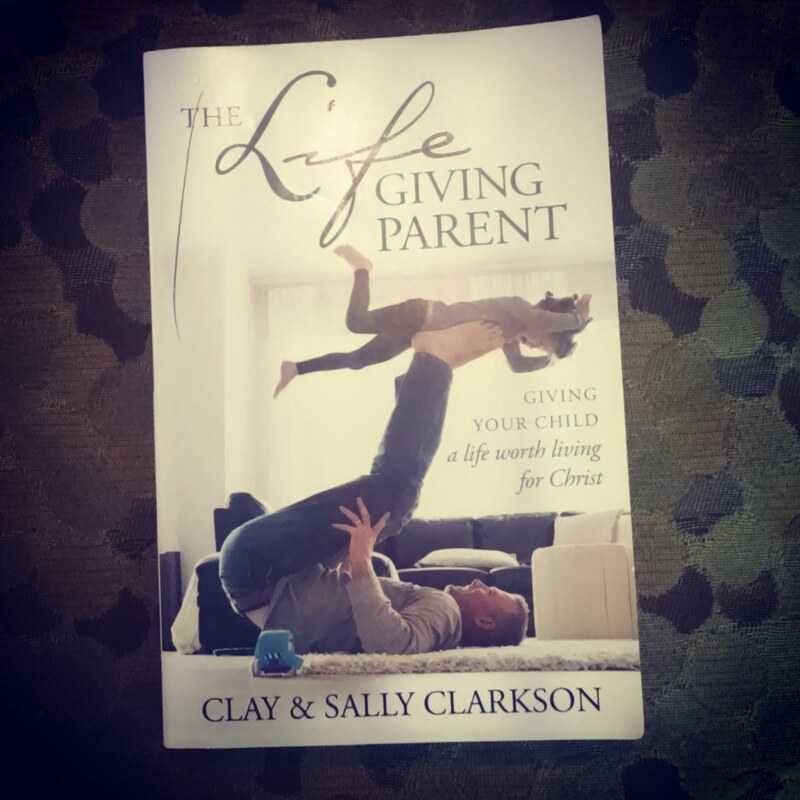 In this book, Clay and Sally address many aspects of Christian parenting, and guidelines for leading our children into relationships with Christ. The book begins with their call to number our children's days (teaching them to have goals and a structure to their day.) They then address nurturing their spirits and guarding their hearts through careful limits on what they view, what they read, and how they spend their time. The next chapters deal with renewing your child's mind by continually leading them to Scripture, strengthening your child's faith by living an active faith before them, and shaping your child's will by helping them desire to obey God. 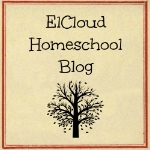 The chapters on building your child's character and forming their imaginations talk about the interactions of daily life where we correct and discipline our children and guide their free-time choices. 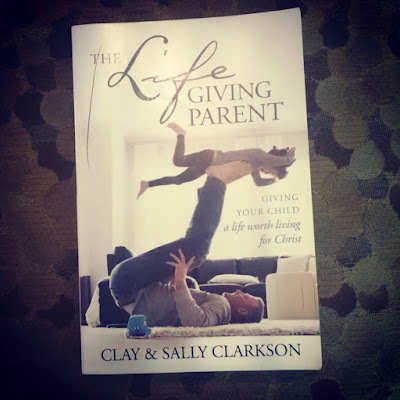 Clay and Sally wrap up the book by talking about the importance of a parent's role in their child's life. We only have one life to give, and our greatest ministry is the one within our own home. Overall, the book is a challenge to rise up and parent in a way that goes against the grain of our current culture. It's counter-cultural to have daily family time, to limit children's exposure to most worldly television, to have daily devotional time and encourage children to follow God's ways. Many would consider these methods to be sheltering children too much, indoctrinating them, and being too controlling. It's counter-cultural to live this way. At times I felt as if I've failed as a Life-giving parent since television and other screens take up much more of my children's time than I'd like to admit. Daily family suppers with conversation starters don't happen here either. If you read the book and feel overwhelmed with areas that you are lacking, just take baby steps. What is one small thing you can improve on? Pick one small change you can make. 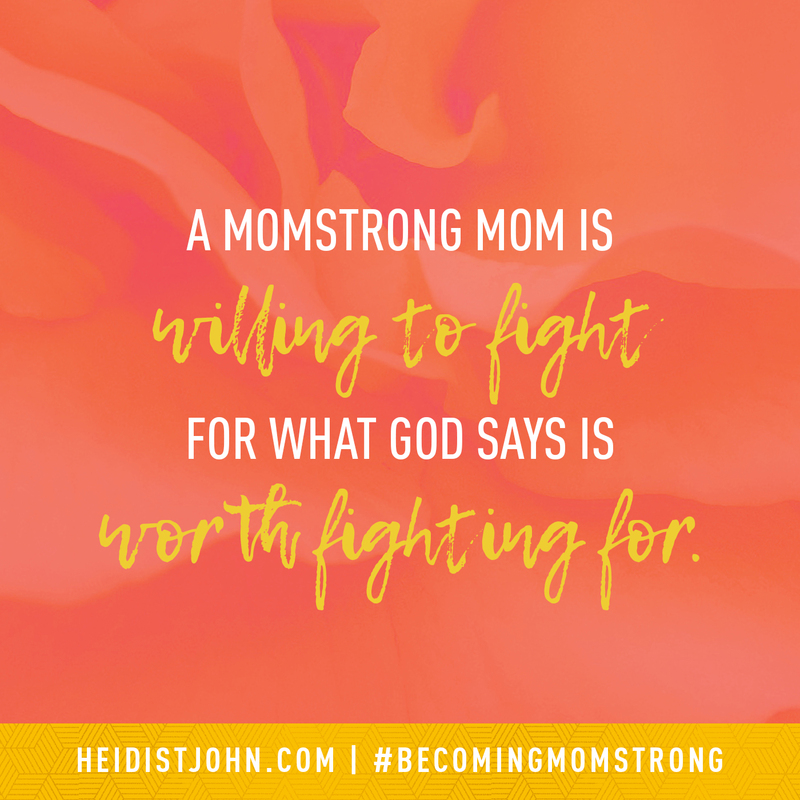 The main heart of the book that I focused on was the ones that talk about letting the Bible and my faith be so important to me that my children can't help but see it. Talk about how God is working in my life so that my kids see Him as an active and caring God. That's the main message and heartbeat I took from this book. 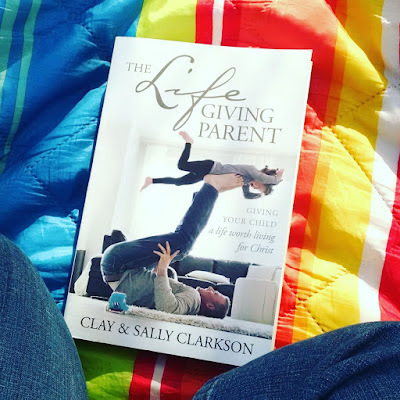 I'm very late in posting this review of The Lifegiving Table by Sally Clarkson. I started reading the book months ago, but I was so wrapped up in survival mode with my family that I found the idea of trying to create a beautiful table experience with meaningful times of conversation completely overwhelming. I made it almost half-way through the book and just didn't pick it up again. Yesterday, I took it with me to read while waiting on my son at baseball practice. I'm just as overwhelmed with loving on my family these days, but I picked up the book again at just the right spot. If' I'd just kept reading one more chapter last time I would have come to the part where Sally pours grace all over the reader and tells us that even a snack meal can be life-giving if it's presented in the right way and your presence is given to your children. We're still just as likely to eat at the couches, on paper plates, before my husband is home from late-hours at work most nights. But this new stage of life has me preparing Sunday afternoon meals for my family and our adult children, gathering together on a weekly basis. It means getting up a little earlier on Sunday morning, and prepping some meal items on Saturday night, but it has been worth the effort. We've pulled out the table cloths and made the effort to be sure our large dining room table (which also serves as our school area) is cleared off on Saturday night and all the non-food items set out ready to go after church. Don't let the idea of family meals or creating a place of beauty for your family overwhelm you. Sally encourages us to make the most of what we have, and creating a respite and gathering place for our family no matter where we are. I may have a cluttered home, a dining room that doubles as a school room, and walls that desperately need to be repainted - but I can still set the table, fill it with good food, and pour love out on my family in the process. "Learning to create beauty and peace in everyday moments was what kept me going in the middle of it all. Food, feasting, and traditions are not frivolous, but ways to make life work, to make it sustainable. Predictable peace, comfort, and fellowship are something every home should provide - at least most of the time." Each chapter in Sally's book ends with something to think about, something to try, and a few of their family's favorite recipes. The something to ponder is usually Scripture, a few devotional thoughts, and quotes. Something to try are practical steps you can take to apply the chapter's message. The recipes range from simple family recipes to delectable treats that the Clarkson's enjoy. I'll be trying some of the recipes myself, though not all of them suit our personal style and food tastes, here.